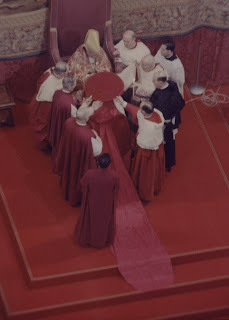 Impressive as it remains, the creation of cardinals was considerably more lavish not all that long ago. Consistories dragged on for days before culminating in a Sistine Chapel rite where the neo-porporati hooded and prostrated themselves for the Litany of the Saints before receiving the now-abeyanced galero (...whose absence one US cardinal grieved by ripping his late predecessors' hats from the cathedral rafters and shipping 'em off to the archives... from which they eventually, mysteriously, vanished) and the likewise consigned-to-history sapphire ring. 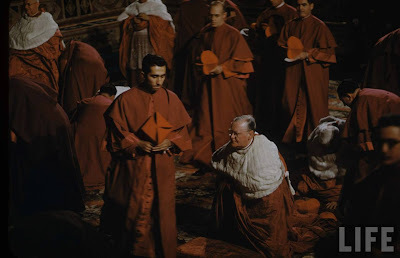 Along the way, another bygone part of the ceremonial saw the Pope tug on the jaw of each new cardinal, opening his mouth that he might freely offer the pontiff wise counsel... then closing said mouth to symbolize his obligation to keep confidences. Then as now, the intent was only half-successful. The Pope's "Senate" depleted by a quarter after the long twilight of Pius XII, this month likewise marks a half-century since John XXIII's first consistory, at which The Cush and a certain Fr O'Hara of Notre Dame were admitted into the Roman clergy alongside the era's heir apparent to the papacy... who defied the fate of most in said position and actually made good on all the hype.